operation: iraqi freedom | ATTACK OF THE RED ENVELOPES! According to legend, Gen. William Tecumseh Sherman was said to have uttered the infamous axiom “War is hell”. Starting in 2002, when American troops invaded Afghanistan and Iraq, we were re-introduced to the hell that is war for the first time since Vietnam. We have seen many a motion picture about soldiers on the front lines, soldiers behind the lines, and the brave faces on the home front. There have been portrayals of both the glory, spirit, and camaraderie, and the pain, claustrophobia, and chaos that is war. But, until The Messenger came along, there hadn’t been a motion picture which focused exclusively on the men and women who perform the solemn duty of informing someone their husband, wife, son, daughter, brother, or sister had died in combat. 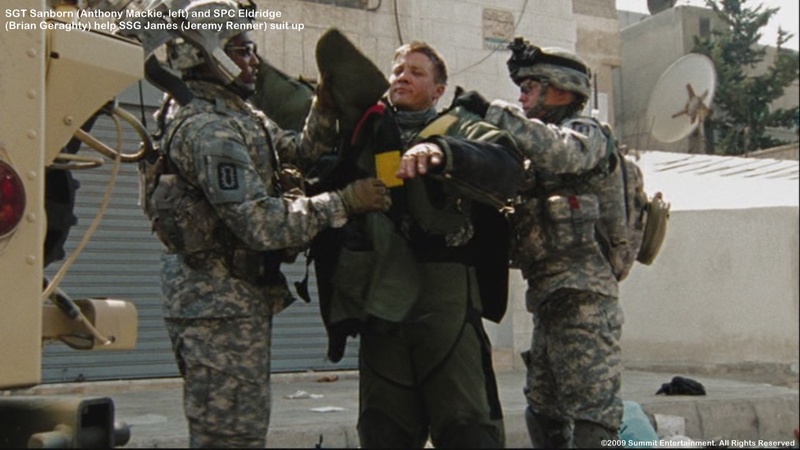 Ben Foster stars as SSG Will Montgomery, who had just returned to the States after recovering from battle wounds sustained in Iraq. With only a few months remaining on his enlistment, he is ordered to Fort Dix, New Jersey, to act as a Casualty Notification Officer (CNO). There, he is introduced to Capt. Tony Stone (Woody Harrelson), who is to be his trainer and partner in performing this duty. From the word “Go”, Montgomery doesn’t like this job nor the man who came with it, but he is a soldier; he is given a job, and he sets out to do it the best he can. The Messenger is one of those movies that sinks into you slowly. And while, by co-writer/director Oren Moveman’s own admission, the tone of the movie is politically liberal, there aren’t any “in your face” moments that speak out against this (or any other) war. Rather, it is an intimate look into the lives of the military personnel assigned to perform this difficult task, and of the families impacted by them. This is a side of war that most of us never see, and that every military family wishes they never do see. It is grim. It is sad. It is gut-wrenching. It is also, unfortunately, the truth. There are six scenes in this movie in which families are notified of a soldier’s death, and each one plays out differently. There is the father (Steve Buscemi) who spits in SSG Montgomery’s face, the father (Angel Caban) who breaks down and cries when he looks back at his grandchild, the mother (Portia) who slaps Capt. Stone upon hearing her son was killed, and the father (Kevin Hagan) who throws up when he receives the news in a store (That last one, by the way, is against current military protocol, but it is based on an actual event in the U.S. Marine Corps during the Vietnam War). Of the other two notification scenes, one is so moving and so poignant, that describing it here would not do it justice, and the other becomes the genesis of an unlikely romance between Montgomery and the widow of a fallen comrade, Olivia Pitterson (Samantha Morton). I had a problem with how this relationship started out, because for one thing, a soldier performing as a CNO should never get personal with the people he encounters while he performs his duty. To me, the whole thing started out as some kind of twisted obsession, but (thanks to wonderfully low-key performances by both Foster and Morton) it evolves into a tender and nurturing relationship with a possible future. Woody Harrelson gave a powerful performance as Capt. Stone. Harrelson proudly proclaims himself to be “pro-peace” (as opposed to “anti-war”), so to see him playing a military officer with such drive and intensity was not only surprising, but brilliant, as well. And though this is very much an independent movie, his performance did not go unnoticed; Woody Harrelson received many accolades for his work in this movie, including an Independent Spirit Award, and Golden Globe and Oscar nominations, all for Best Supporting Actor. There are several special features on the DVD, the most important of which is a companion-piece documentary called “Notification”, in which both Army CNOs and family members of the fallen share their stories on how the casualty notification process works. There is a behind-the-scenes look back by the cast and crew after finishing the movie, and a Q&A hosted by Variety magazine. And, for all you aspiring screenwriters out there, the DVD also features a .pdf version of the shooting script, which provides an excellent template for how movies should be written. The Messenger is a powerful and moving motion picture that not only shows you just how difficult it is to be a CNO, but it is also smart enough to know when to let its hair down and enjoy the moment. Subtle and nuanced performances by Ben Foster, Woody Harrelson, and Samantha Morton make this movie required viewing. And on this weekend, in which this nation observes its anniversary, it serves as an invaluable reminder for all of us to honor those who have made the ultimate sacrifice for us.